P-O-D-S are a very mixed bag. These are steel boxes, and there are wood versions, which are dropped off at your client’s home, and then the client gets them loaded somehow, and the PODS company comes back and picks them up and delivers them to the destination. 4) The PODS are irregular sizes and the PODS incoming sales people frequently underestimate how many you need and then you need to call and order additonal PODS, and get an upcharge once you are already committed. What looked like a good deal renting two PODS, may no longer look so cheap if have to rent four PODS! PODS and wood crates can help with “sideline storage,” but they are not effective for moving a high-value, high-volume house. As a Moving Company, we have been called out to unload PODS which someone else unloaded, and when we opened the doors, the furniture was laying broken in a heap in the middle of the POD. Even if we made the customer sign a waiver, before loading the PODS, we do not want to be associated with unhappy customers. So we could not take on the job of Loading the PODS in the situation of a high-value, high volume load. 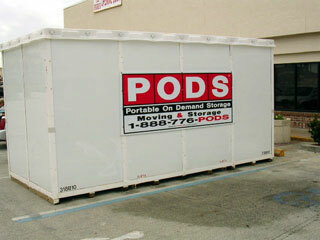 But PODS are effective with smaller, lower volume loads. And we don’t have a problem with unloading PODS because the customer then doesn’t think us responsible or hold us responsible for damage. We have a customer who works for Coca-Cola and moves around the country, and uses a single POD each time. She has it loaded “to the gills” and then leaves whatever doesn’t fit. If you can fill the POD to the brim, then you can often get away with not tying down the load. But on a big load which requires three and one-half PODS, what do you do about the last POD which is only half full? You don’t want the customer at destination to open it up and find everything in a heap!